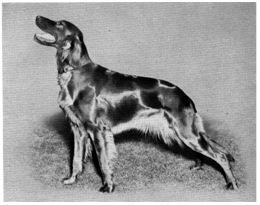 The Group of Setter breeds, English, Irish and Scottish Gordon, emerged as a result of the changing patterns in agriculture and the introduction of the sporting shotgun. As a result the gentry required a hunting dog that was longer legged and faster than a Spaniel, one that was capable of great endurance, which could range over large areas of field and moorland hunting by scent. Then point or ‘set’ (the origin of the name Setter) game birds until instructed to flush them, by putting the birds to flight, so they could be shot for the pot. This purpose the Irish Setter fulfilled with dash and flare. 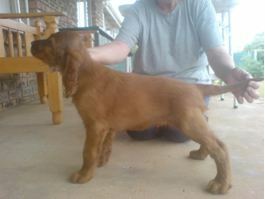 By the beginning of the 18th century, a distinct type of Setter had evolved in Ireland which was predominately white, with red patches, but as the solid Irish Red Setters became popular the parti-coloured dogs fell from favour. Interestingly, after several failed attempts, the Irish Red and White Setters were resurrected as a separate breed with the Kennel Club of UK reopening registration in 1979. The sport of Breed Showing began in England. The first show being held in1859 for Setters and Pointers and continues to this day around the world. 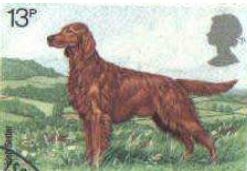 The following year there was a separate breed class for Irish Setters at the Birmingham show and by 1875 in Dublin, Ireland there were 43 Irish Red Setters and 23 Irish Red and White Setters. 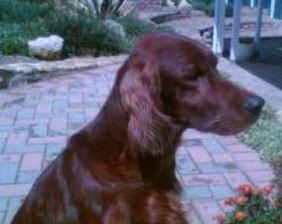 By 1886 the Irish Red Setter Club, Dublin had drawn up the first breed standard for conformation quality. This was revised in 1930 when the British Kennel Club brought all breed standards under their governance. It has stood the test of time and with little revision is that by which Irish (red) Setters are judged today in UK and South Africa. 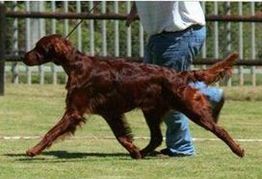 The association between British bred Irish Setters and South African has spanned more than a century with many imports from top breeders. The local fraternity was “Proudly South African” when in 1981 Mrs. & Miss Tuite’s Ch. 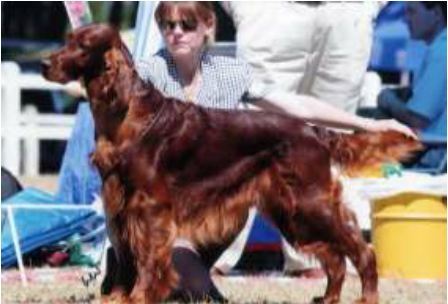 Astley’s Portia of Rua was the first Irish Setter to win Supreme Champion at Cruft’s in UK, the mecca of all breed dog shows. 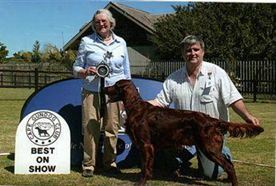 Portia was awarded her Championship from the Show bench and in the field as a gundog. In her ancestry were Redsun Roland of the Rand, SA Ch. Redsun Honey and SA Ch. Redsun Regan, bred by the late Mrs. E. Mcbride. 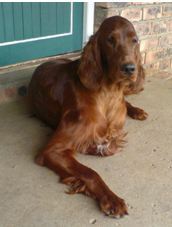 In South Africa today, Irish Setter pedigrees reflect three Supreme Cruft’s Champions, namely, Sh. Ch. Danaway Debonair 1993 (bred by Mary Gurney), Sh. Ch. Starchelle Chicago Bear (bred by Rachel Saw-Rainey) and in 2000 Sh. Ch. Caspians Intrepid (bred by Sue & Mike Oakley and sired by Debonair) along with many others imported and locally bred Irish of note. Int.FCI & SA Ch. Apollo of the Chicken Farm imported from Belgium by Mr. A. Wonfor and SA Ch. Oakdales Hot Toddy owned and bred by Mrs.B. Simpson. Both stud dogs have been awarded the Kennel Union of Southern Africa’s Advanced Registration Certificate. 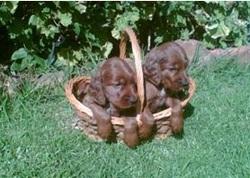 SHOULD YOU OWN AN IRISH SETTER? Most Irish Setters, today, are purchased as family pets as they are highly social companion dogs demanding the attention of both the humans (of any age) and other animals (canine, feline or equine) in the family. However they are NOT suitable for all, especially those requiring a “guard dog” or who live in accommodation which is very limited i.e. a townhouse. 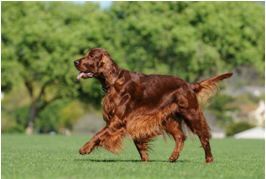 Prospective owners are often drawn to the breed because of its beautiful red coat, BUT they must first consider whether their lifestyle and environment are compatible with the needs of an Irish Setter which will require many hours of mental and physical stimulation as well as care. The practicalities of feeding a pup at regular intervals throughout the day, grooming, house training and teaching basic obedience to become a good canine citizen will require the attention of at least one responsible adult and involve the commitment of the whole family. The best homes are those where the family decides to “adopt” an Irish as a much loved household member in an environment where the dog will thrive for its entire lifetime (approximately 12 years). They need not own a farm or smallholding, but must have a fully enclosed reasonable sized garden area and be prepared to take excursions to local parks, open countryside and/ or the beach for good galloping exercise once a day in all weathers. 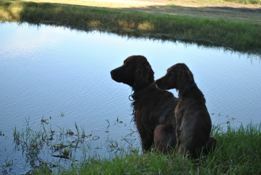 FROM WHOM SHOULD YOU PURCHASE AN IRISH SETTER? The Kennel Union of Southern Africa has a website ( info@kusa.co.za ) where you will find a list of Accredited Breeders who responsibly ensure that the parentage of a pup has been DNA tested for Canine Leucocytes Adhesion Deficiency (CLAD) a deadly auto-immune inherited condition and Progressive Retinal Atrophy rcd 1 (PRA rcd1) which results in early onset blindness. The progeny from clear parentage can be guaranteed CLEAR of these conditions. The parentage of a pup should be hip X-rayed and scored under the SAVA/KUSA Scheme for Hip Dysplasia. Although this condition is present, scores are usually low and does not appear to debilitate the breed. However, due to anomalies regarding mode of inheritance, no breeder of any breed can guarantee freedom in progeny and undoubtedly nutrition and exercise while growing play a role. All the above health screening results of the sire and dam plus the fact that the pup is Inherited Clear of CLAD and PRA rcd 1 will appear on the Health Screening Annexure Certificate issued with the pup’ s KUSA Registration Certificate & Certified Pedigree and will also indicate the pup’s microchip coded number. 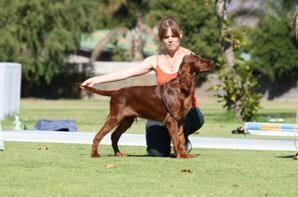 Reputable breeders will provide information regarding diet, vaccination, deworming and initial training and generally offer a helpful back-up service, if the new owner is concerned about any topic related to the pup. 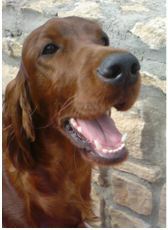 It is a privilege to own an Irish (Red) Setter and devotees cherish the breed.